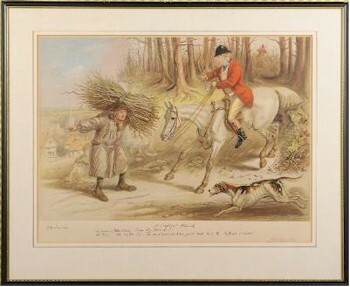 Sporting Prints have been popular in the Britisish interior for over two centuries. Sets of hunting and steeple chasing prints and engravings by artists like Samuel Alken (Senior and Junior) illustrate the story from The Meet to The Kill and The Start to The Finish. And the senior Alken dynasty artist, Henry Thomas Alken (1785-1851) produced a whole range of popular sporting engravings in the early 19th century including On The Road to The Derby, Studies of The Horse, The Beauford Hunt and Sporting Illustrations – Shooting. Harris After Henry Alken: Fore's Steeple Chase Scenes (SC21/504). George Hunt was another prolific 19th century sporting engraver after original works by other artists. His subjects include Foxhunting, Shooting, Fly Fishing, Trolling for Pike, Worcester Race Course, Trimming a Horse and Football after Cruikshank. 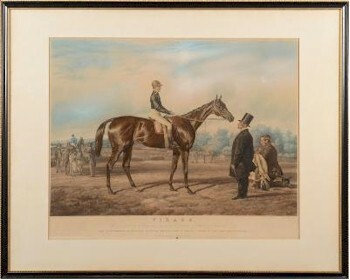 John Harris After Thomas Barratt (19th Century): Virago (SC21/505), who was a winner of 10 Races in 1854. There are also superb sporting prints from further a field that depict exotic hunting scenes in the jungle and far flung corners of The Empire by artists like Henri Merke who produced plates for Williamson & Howitt's 1807 folio of Oriental Field Sports, which include an engraving entitled Shooting A Leopard. 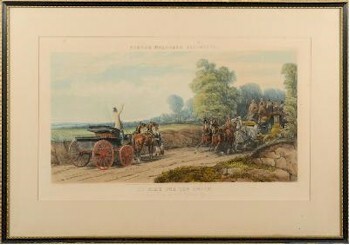 After John Leech: a coloured lithographs published by Agnew & Sons (SC21/510).